Louis Butelli stars in Henry V at the Folger. 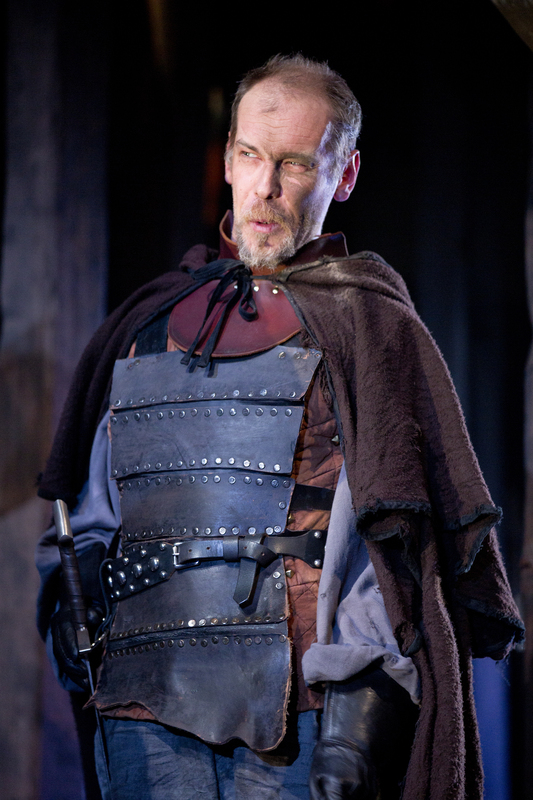 Hello from Louis Butelli, currently playing Bardolph (and others) in Robert Richmond’s production of Henry V, now playing at Folger Theatre! We’re up and running, the press has been great and really great, and we’d love for you to come and see us. You should definitely click here, and get your tickets now. Also, check out this blog entry by the extraordinary Katie deBuys, who plays Katherine of France and the Boy (or Davy, as we call him) in Henry V.
Meanwhile, I just wanted to talk about historicity for a second, if that’s a word. Henry V represents a kind of finale to a series of history plays, but Henry (or Hal) and his large family are also woven hugely into the rest of Shakespeare’s work. The influence of sitting monarchs, and of their relatives in court, dead or alive, appears in loads of his plays. Walking through the exhibition currently in the Folger’s Great Hall, one wanders past an original copy of Holinshed’s Chronicles, from which Shakespeare certainly borrowed very, verrrry liberally. It’s pretty thrilling to spend time here in a place where the blending of history and abstraction are a part of daily life. It is even more thrilling when our slow understanding of abstraction is occasionally smacked in the face by the discovery of something literal. 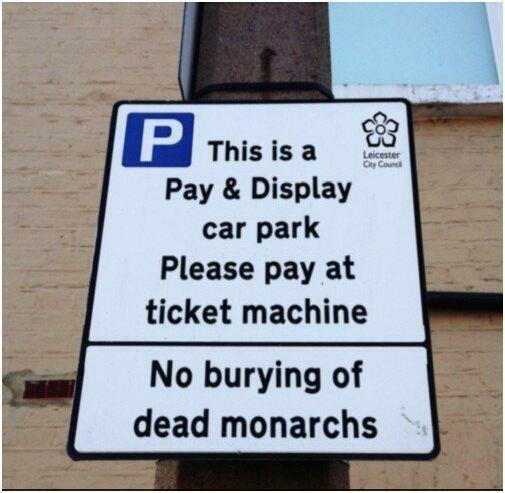 Last fall, an old skeleton was discovered buried underneath a municipal parking lot in Leicester, England. This Monday, a team of historians, archeologists, and DNA experts confirmed the identity of the skeleton. 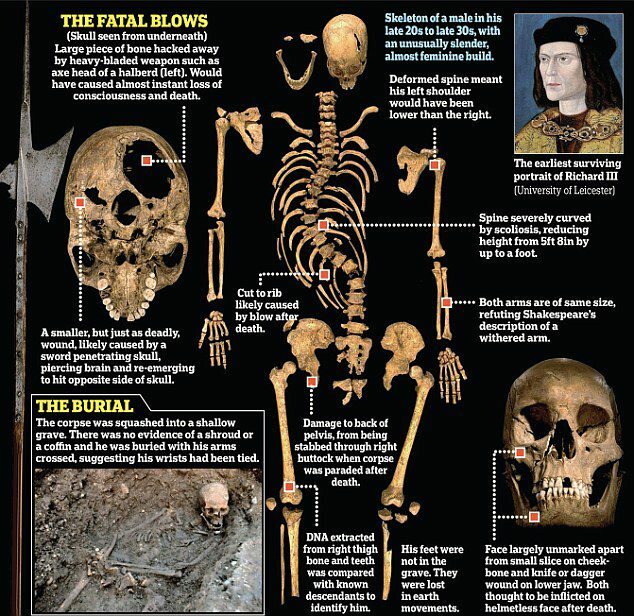 It’s King Richard III. There are tons of ways in which this explodes the scholarship on Richard. There are also tons of people, smarter people than me, who can dig into that for you far more thoroughly than I can. I could quote from an article, as I like to do, but you should probably just start with this piece in The New York Times. For me, I was sort of enthralled by what the actual physical evidence might have to say about this character. Richard’s physicality is so vitally important – both to the plot of the story, and to our own nightmarish visions of what this “withered” king might have looked like. How might he have behaved? How might he have moved? That, then, brings me to another article, which discusses the Battle of Towton (March, 1461), which the article refers to as “the bloodiest battle in English history.” Henry VI, Henry V’s son, is the man to thank for this one. More specifically, though, the article deals with the “unidentified” skeleton of a man, “somewhere between 36 and 45 when he died” of multiple wounds from bladed weapons. The article pieces together the fleeting details of this guy’s life pretty convincingly. Article here. Why am I so taken by these two skeletons? I’m not entirely sure. Certainly the sociological disparity between these two men is compelling – one a King, and one “unidentified.” Certainly ideas about the collisions between ancient war, with our axes, and modern war, with our robots, drive the imagination. Certainly we can consider how popular entertainment, in the form of old songs or odes or poems or plays, has transmuted throughout history into more blatantly gladiatorial entertainment. Certainly we can see ourselves embedded somewhere in these skeletons. 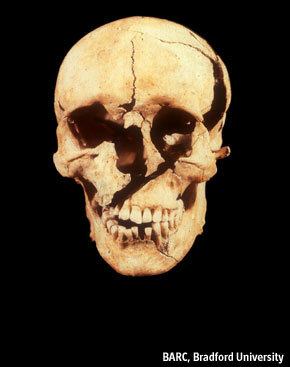 I’m excited by the discovery of King Richard III’s skeleton, and by the rush to re-investigate his legacy. Yet, potential Tudor Smear Jobs aside, I think I’m more excited by the entertainment Shakespeare created for the fictional Richard. I’m excited to learn the gruesome ways in which King Henry V’s army dispatched the French, and the politics of why Shakespeare couldn’t write the play for him that he may have wanted to write. Still, I think I might also just really love Harry/Hal, and enjoy spending time with him. Regardless, these questions are for all of us, and we’ll be asking them every night at the Folger Theatre – now extended until March 10. Come and see Henry V!